Jan Traylen: Hagia Sophia: A Landscape of Images. Later the Aya Sofya Mosque and now a museum. Byzantine architecture. At different times in history the former Orthodox patriarchal basilica has been a Catholic Church and Mosque. 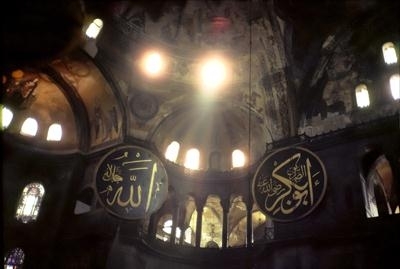 The sunlight streams through the windows to lighten the dark interior of this ancient building in Istanbul, Turkey.